The world’s first and only polar bear to be born in the tropics has died in Singapore, ending the long and controversial story of the beloved animal. Inuka, a male polar bear born in Singapore in 1990, succumbed to age-related ailments on Wednesday, Reuters reported. At 27, Inuka — meaning “Silent Stalker” in Inuit — had been suffering from arthritis, dental issues and ear infections. The bear’s limbs were also badly weakened, meaning he struggled to walk. Having outlived the average wild polar bear lifespan by 10 years, it is little surprise that time finally caught up to one of Singapore’s most famous residents. 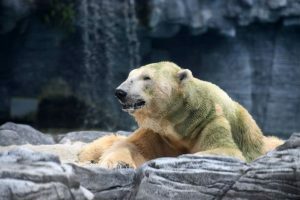 Inuka lived in a climate-controlled enclosure, which attempted to mimic a frozen tundra environment to help him cope with Singapore’s tropical heat. Sitting close to the equator, the island city-state is warm all year round, rarely posting temperatures lower than 77 degrees. Inuka was the fourth polar bear to be housed at Singapore’s zoo, the son of father Nanook and mother Sheba, who were been brought to Singapore from Canada and Germany, respectively. Though a popular attraction, Inuka became a lightning rod for animal activist and conservationists’ criticism, who argued that keeping an arctic animal in a tropical zoo was cruel. Opposition was magnified when Inuka and his mother, then still alive, began turning green due to algae in their fur. Though the zoo argued it was harmless, for critics it illustrated how unsuitable Singapore was for Inuka. Writing for Newsweek in 2017, Ben Williamson — senior international media director of People for the Ethical Treatment of Animals — said captive polar bears are fast to develop abnormal and neurotic behavior in captivity. Williamson wrote that some zoos have even resorted to giving bears anti-depressants to curb their anxiety. The species is built to survive extreme cold. In their natural Arctic habitat, polar bears must survive average winter temperatures as low as -29 degrees. Polar bears can walk up to 20 miles a day and are also strong swimmers. Animal rights groups believe that no artificial zoo habitat can account for such a lifestyle, and that to confine such nomadic animals to an enclosure is traumatic for them. After holding discussions on the welfare of its animals, the zoo announced in 2006 it would not bring in any new polar bears after Inuka.